So there's now less than three weeks to go until Christmas Day (19 days in fact), and between now and then Prog Magazine is bringing you a proggy Christmas song every day to help you get in the festive spirit. Today it's the turn of folky proggers Steeleye Span, and the band's reworking on the traditional In The Bleak Midwinter, from their 2004 Christmas album Winter. Amazingly the Span had never recorded a seasonal album prior to this, despite their love of folk and traditional music, but here singer Maddy Prior, who had only rejoined the band in 2002 having left in 1997, lends a delightfully gentle vocal to the famous carol. 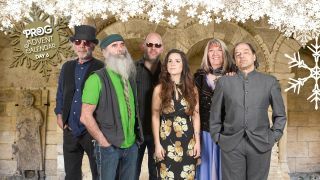 Next year Steeleye Span celebrate their 50th anniversary, with plans to record a new album, a follow-up to 2016's Dodgy Bastards, with a tour planned for April.